Ladies and Gentlemen. Steelers Nation is opening its mouth and raising the pitch of its voice to the sound of a roar. Two weeks ago ESPN kicked off a poll in anticipation of a series profiling the NFL’s greatest 20 coaches. Over 50 coaches were listed, from No Brainers like Vince Lombardi and Paul Brown, to head scratchers like Dennis Green and Jeff Fisher. Now fifth place is no dishonor in such a broad sweeping poll, but it was the company that Noll was behind which was at issue. Namely Bill Belichick and Bill Walsh. 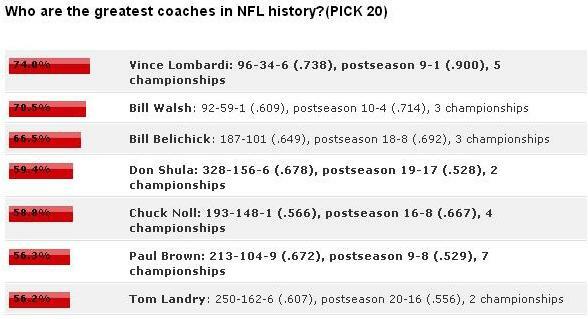 Not only has Chuck Noll increased his share of the vote, from 58.8% to 66.4% he has also passed Don Shula for four place and now is within striking distance of Bill Belichick! Now is the time for Steelers Nation to redouble your efforts. You must vote early, and vote often. That’s right, you need to vote often. The even better news is that ESPN’s cookie-control seems to be time sensitive, so if you voted two weeks ago, you can probably vote again. If you’re looking for objective reasons to not vote for Belichick and/or Walsh to promote Chuck Noll, then you can click here for our original article or see BTSC’s article. Click here now to vote for Chuck Noll in ESPN’s poll. This entry was posted in Steelers Nation and tagged Chuck Noll, Pittsburgh Steelers. Bookmark the permalink.